I'm still trying to use all of my cartridges. I made this card from the cartridge Bump in the Night. I just love the eye stickers from Creatology. The sentiment goes perfectly with this little monster! I tried to use more boys colors, as I have a hard time making those cards. I tried to keep it simple and not add alot of extras. Thank You so much Janis at Pause Dream Enjoy who has made me a Design Team Member. I'm so excited to join a lot of talented ladies. I look forward to having lots of fun and sharing my projects. 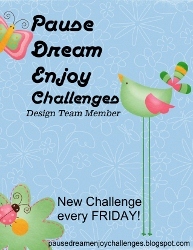 I hope everyone will stop over and join in the fun challenges every Friday! I love Halloween projects. Have been working on a few that I'll be posting soon. Thanks! Too cute Tara. Love he little monster. Great colors for a boy. Congrats on your new DT position. Tara, this is so cute! Congratulations on your new DT position. Congrats to you!! !Super Cute Card!! I'm happy to be joining you on the team Migdalia! Congratulation and best wishes on being chosen for the design team!! Love your work and you will be great!! 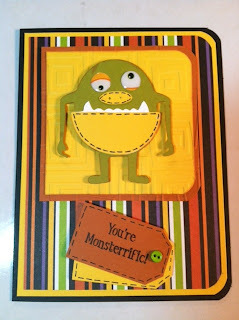 Adorable Monster card! I am your newest follower! Great blog. Love all the purple and bling! 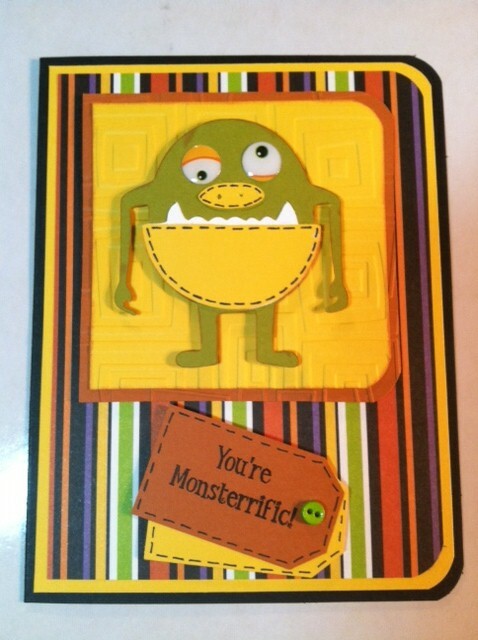 Your little monster card is adorable. Watched a recent video too and sounds like you're from up north - not the desert (just a slight accent). Wishful thinking or transplanted? Too funny. Great card in the video! Can't wait to see what you come up with next. Whatever it is, I'm sure I'll love it! Oh my goodness now he is just way too cute! My son would love this! Super cute monster! Fun paper!